New puppy at home? With a little discipline and the right treats, you can put your puppy on the path to healthy habits and happy chewing – for everyone! Satisfying your new pup’s chewing urge and boundless energy with treats and chews is a great way to avoid finding chewed up shoes and furniture and to provide a number of health benefits for your pup. For maximum benefit, veterinarians suggest feeding puppies food and treats that avoid additives, fillers, preservatives and toxic ingredients. Chewing on bones is vital for scraping away plaque buildup and relieving bad breath. Chewing can also prevent periodontal disease and yellowing of teeth. Take care of your new puppy’s teeth with beneficial treats that they will love to chew. When you are busy around the house, your energetic puppy may still want to play. There are a number of ways to keep your pup occupied. Bones are one way to keep their brain active for hours. Keeping your dog stimulated is beneficial for all ages. Arguably the most important benefit of chewing bones is helping the puppies grow their adult teeth. You may notice they are eager to chew on anything they can, but really, they just need something to satisfy the discomfort of adult teeth poking through. Chewing on bones can make the growing process easier on the puppy and your furniture! Professional dog trainers encourage using a high rate of reinforcement for optimal training. Therefore, you want to keep the treats small, soft, and fast-eating. 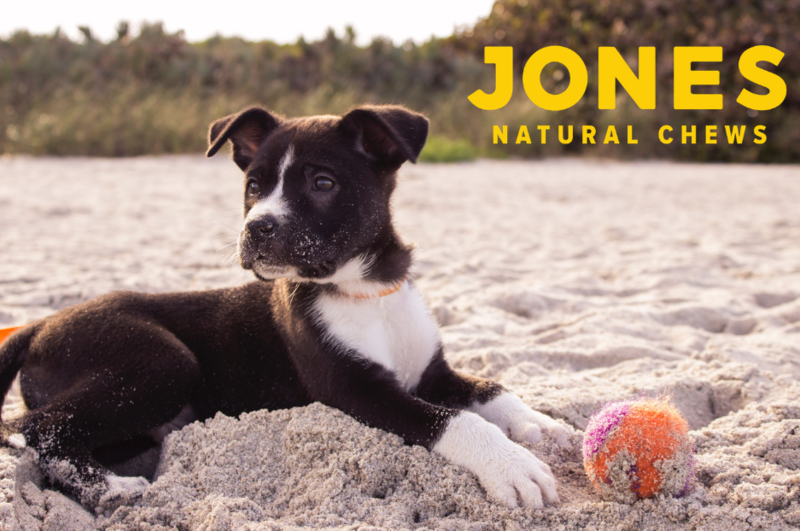 Jones Natural Chews has a variety of healthy and natural options sure to keep your pup happy. Our Knee Cap bones and Stuffed Bones are perfect for any size dog, while the Shank Bones are best for puppies that are already growing into their medium/large frames. We also make several types of jerky products that break apart easily, making them ideal for training. No matter which treat you choose, be sure to supervise your puppy while he is still developing healthy chewing habits. Whether training your new pupper or looking for go-to treat options for your long-time companion, Jones Natural Chews has the variety to satisfy dogs of all ages and stages. Jones Natural Chews only offers products that are 100% sourced, raised and Made in the USA. That means you can count on your dog enjoying nutritious, all-natural treats and chews without missing out on the delicious taste.